There is a lot of hand-wringing and distressed looks going on right now in the American Jewish world. According to a recent articlemaking the rounds concerning the state of American Jewry by the Pew Research Center's Religion and Public Life Project, things are looking pretty grim. Whoa, hold on a second. I don't see any mention of Chabad in there. Chabad you ask? You betcha! According to the Union of Reform Judaism website, there are 875 Reform synagogues in the United States and Canada. 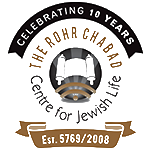 But Rabbi Motti Seligson from Media Relations for Chabad.org told me that there are 959 Chabad centers (part of over 1500 Chabad institutions) just in the United States alone. That is more than the so-called strongest branch of Judaism in the USA.